Fumarolic steam plumes and eruption clouds rise like convetive turbulent columns into the atmosphere. Formulae are presented here for estimating the heat power of plumes, the production rate of juvenile pyroclasts ejected during eruptions and the heat output of fumaroles. Their accuracy is tested using the well-studied examples of eruptions of Kamchatkan volcanoes. The Briggs (1969) formula may be used in observing the ascending part of a plume in crosswinds. The best results have been obtained using the CONCAWE formula which permits estimation of the heat power in crosswinds based on the axis height of a horizontal part of a maintained plume. Three connected equations have been suggested for a stable atmosphere and calm weather conditions. The first one, which is applicable for heights ranging from 100 m to 1 km, is the formula proposed by Morton et al. (1956). This equation changes for higher layers of the troposphere (1–10 km) and stratosphere (10–55 km). A classification scale was constructed allowing us to compare volcanic eruptions and fumarolic activity in terms of the intensity of their plumes. The described method is useful for volcano surveillance; it helps in the study of the energetics and mechanics of volcanic and magmatic processes. A quasi-stationary magma flow rate in asthenospheric and crustal conduits of central type volcanoes and volcanic centres was studied analytically under the following conditions. Magma rises through cylindrical channels in which the magma temperature does not change with time, but the wall rocks are gradually heated. The magma rates were calculated for basaltic, andesitic and dacitic volcanoes using the “continental” and “oceanic” geotherms. It follows from these calculations that the magma supply rate may determine the kind of activity of a volcanic centre, being constant for large and very active volcanoes, intermittent for usual volcanic centres of island arcs or sporadic for volcamic fields, clusters of cinder cones and areal volcanism. Theoretical conclusions are consistent with observational data. The paper discusses the mechanism of deep magma activity beneath island are volcanoes and similar structures on the basis of data from geophysical investigations in Kamchatka; the analyses of forces that cause the ascent of magma; and related phenomena that are due to hydrostatic forces. It is shown that the ascent of magma through the astnenosphere occurs most likely in magma columns with a diameter of approximately 700–2,000 m and with a velocity of about 0.8–3 m/year. A regular line of such columns spaced in Kamchatka at a distance of about 30 km gives rise to a chain of separate Etrge volcanoes or volcanic centers. Ultrabasic magmas are most likely accumulated near the M discontinuity, whereas the apparent place of andesitic magma accumulation is in the earth’s crust near the boundary between the basement and sediments. The results of detailed seismic investigations during the period 1961 to 1964 are described. Accurate data of focus location for Kamchatka and the Commander Islands are cited. The majority of earthquakes are located in the Pacific focal zone and the others are found in such remarkable tectonic regions as the east Kamchatka ranges, the continental slope of the Commander Islands, etc. The focal zone seismic activity decreases with increasing depth. The seismic activity at a depth of 250 km is 100 times less than the activity at a depth of 0–20 km. Kamchatka earthquake locations in relation to the Kuril-Kamchatka Island arc and deep water trench are approximately the same as those of the south Kuril Island earthquakes. The Kamchatka active volcano belt coincides with the region of earthquakes having focal depths of 100–200 km, especially between 125 and 175 km. S-wave screening in the magma chambers under the volcanoes is observed. The Avacha volcanic cluster magma chamber at a depth of 20–80 km has the form of a column, 25 km in diameter. P-wave velocity in the upper mantle under the Pacific Ocean and between the Aleutian trench and the Kuril-Kamchatka trench is about 8.2 km/sec, and under Kamchatka 7.7 km/sec. Local velocity decreases to basaltic range (Vp = 72 km/sec) in the upper mantle at a depth near 70 km under the east Kamchatka active volcano belt. Fedotov S.A. Study and mechanism of the simultaneous 1996 Karymsky volcano and Akademii Nauk caldera eruptions in Kamchatka // Volcanology and Seismology. 1998. V. 19. № 5. P. 525-566. A mechanism, of formation of magma chambers that feed volcanoes is discussed. Heat conditions and dimensions of magma chambers which have existed for more than several thousand years may become stable. The approximate equations of heat balance of these chambers are derived by calculating the temperature T1 of the magma entering chambers and the radii a of chambers. Calculations show that the radius of the shallow "peripheral" chambers of the Avachinsky volcano is less than 3-3.5 km. Possible maximum radii of "peripheral" magma chambers were estimated for the Kamchatkan volcanoes of medial size. The temperature difference in their chambers may reach 100-200 "C. This method can be applied to the calculations of "roots" of central-type volcanoes. The sources of geothermal energy of Kamchatka are hydrothermal systems, local blocks of high heated rocks, and peripheral magma chambers of active volcanoes in particular. According to gravimetric, magnetic and seismic data, under the Avachinsky volcano there exists an anomalous zone which is suspected to be a peripheral magma chamber. It is localized at the boundary of the Upper Cretaceous basement and an overlying volcanogenous stratum at a depth of 1.5 km from sea level. Its geophysical data are as follows: the radius is 5.2±0.9 km; the density of rocks is 2.85 to 3.15 g/cm3, the velocity of longitudinal waves is 2200 m/sec, the viscosity of rocks is 105 to 108 poise. The temperature distribution in the near-chamber zone was calculated by clcctrointegrator at 0°C at the Earth's surface and 1000°C at the chamber surface for stationary and non-stationary (the period of 20 000 years) heating. Heat extraction may be possible if a system of artificial jointing iscreated. The capacity of a thermal reservoir with a volume of one cubic km at a depth of 5 km and a distance of 6 km from the volcano would be 2 x Ю14 kcal, extractable under non-stationary conditions, which could provide the work of power stations with a total capacity of 250 MW for a period of 100 years. 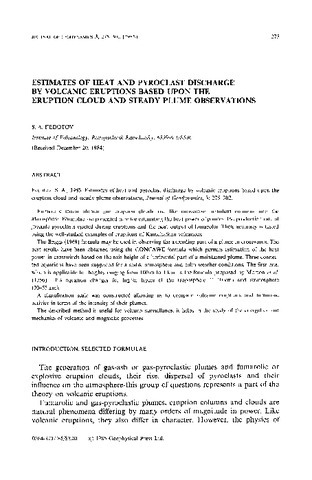 The paper describes the course of the Large Tolbachik fissure eruption taking place in Kamchatka from July 6, 1975 to December 10, 1976. The eruption zone extended for 30 km. The formation of monogenic scoria cones nearly 300 m high, lava tubes and basalt sheets up to 80 m thick and more than 40 km2 in area and subsidence of the Plosky Tolbachik summit caldera to a depth of more than 400 m were observed during the eruption. The volume of eruption products amounted to more than 2 km3. It was the largest basalt eruption which has taken place in the Kurile-Kamchatka volcanic belt in historic time. chambers located in the lower crustal layers or in the crust-mantle transition layer.